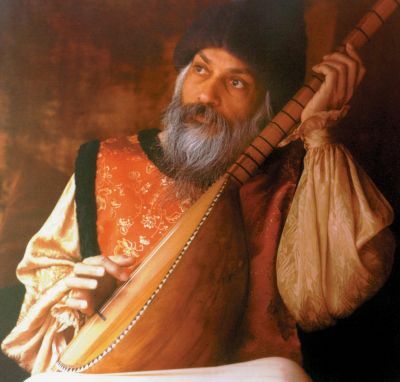 You can read or listen to these discourses of Osho about love, relatedness, friendliness and awareness in several ways. The energy of these magnificent discourses the Beloved#9 and the Divine Melody#9 is the best transmitted if you listen to them. There is also a version of an extract of the Beloved#9 combined with classical music. This combination of great classical music and Osho words enhances this loving message even more. For the ones who want to have first a ‘taste’. There is an extract of an important part of the Divine Melody on this page and you can read the whole lecture as pdf. The Beloved#9 is so exquisite then in my humble opinion you MUST listen to it to savor it. can comprehend the language of a lover’s heart. Others have no clue. . . . The Baul mystics are children of celebration. They celebrate life, they celebrate death. Whatever is, is seen as a gift. No distinctions between high and low, gross and fine; they simply love life in all its aspects. They sing their love, they dance their prayers. 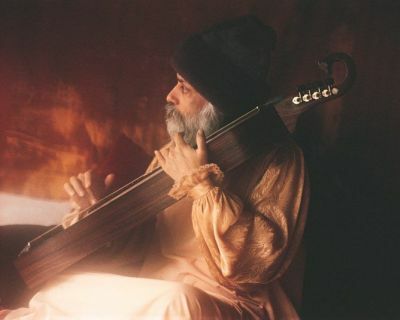 The vision of a Baul is unique: he is already feasting at his Beloved's table. He is not postponing, he is not working for some future attainment. Now is the only moment, love is the only method. To a Baul, love is the natural religion. He allows his love to carry him to the next moment, the next happening; and he is a welcoming. He plays his musical instrument, sings his song; the totality of his ecstasy is his meditation. His God is essence, his vehicle spontaneity. He is a lover. . . .
of the feelings in loving? to the rays of the sun. 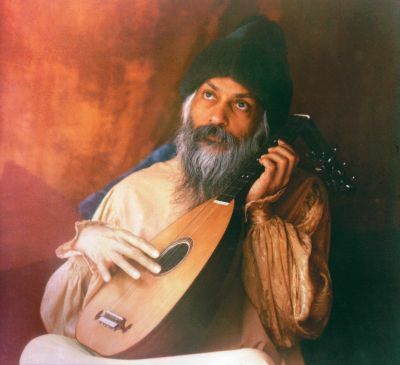 Osho: The Divine Melody #9: The pause between two notes. And the song remains immaculate. Unless you have known what love is, you have not known what melody is. It is the meeting, orgasmic meeting, of death and life. Unless love is known, you have missed. You were born, you lived, and you died --but you missed. You missed tremendously, you missed utterly, you missed absolutely --you missed the interval in between. That interval is the highest pinnacle, the peak experience. Kabir calls it the divine melody. To attain it, there are four steps to be remembered. -because love is possible only in the herenow. You cannot love in the past. Many people do that, but you cannot really love in the past. Many people simply live in the memory --they loved in the past. And there are others who love in the future --that too cannot be done. These are ways to avoid love: the past and the future are the ways to avoid love. So either you love in the past, or you love in the future --and love is possible only in the present, because only n this moment death and life are meeting... in the dark interval that is within you. That dark interval is always present, always present, always present. It is never past and it is never future. If you think too much --and thinking is always of the past or of the future --your energies will be distracted from feeling. Feeling is herenow. If your energies are moving into the pattern of thinking then you will not have enough energies to move into feelings --and love will not be possible. So the first step is: be herenow. Future and past bring thinking; thinking destroys feeling. And a person too much obsessed with thinking, by and by completely forgets that he has a heart too. A man who is too much into thinking, by and by starts moving in such a way, starts living in such a way, where feeling has no say. Not listening to the feeling, by and by feeling starts falling away from him. There are millions of people in this state, who don't know what heart means. They think heart is just a pump. Their whole concentration is in the head. Head is an extremity; it is needed, it is a good instrument, but it has to be used as a slave. It should not be the master. Once the head becomes the master and the heart os left behind, you will live, you will die, but you will not know what God is because you will not know what love is. The same dark interval, first contacted looks like love... and when you are lost into it totally, it becomes God. Love is the beginning of God --or God, the ultimate peak of love. The second step towards love, and towards the divine melody, is: learn to transform your poisons into honey. Because many people love, but then their love is very much contaminated by poisons --with hate, with jealousy, with anger, with possessiveness... a thousand and one poisons surround your love. Love is a delicate thing. Just think of anger, hatred, possession, jealousy: how can love survive? First, people move into the head and forget the heart --they are in the majority. Then a minority still lives a little in the heart, but then that minority does another wrong: the small light of love is surrounded by jealousy, hatred, anger, a thousand and one poisons. Then the whole journey becomes bitter. I told you, love is the ladder between heaven and hell, but the ladder is always a two-way thing: you can go up, you can come down. If there are poisons, the ladder will bring you down --you will be entering into hell and not into heaven. And instead of attaining to a melody, your life will become a nauseous noise -conflicting, traffic noise; just a maddening noise --a crowd of many noises with no harmony. You will remain on the verge of madness. So the second thing to remember is: learn to transform your poisons into honey. How are they transformed? There is a very simple process. In fact, to call it transformation is not right, because you don't do anything; you only need patience. This is one of the greatest secrets I am telling you. Try it: when anger comes you are not to do anything; just sit silently and watch it. Don't be against it, don't be for it. Don't cooperate with it, don't repress it. Just watch it, be patient, just see what happens... let it rise. Remember one thing: don't do anything in the moment of anger --wait. Just give it a little time and wait... and you will be surprised. And one day you will understand that if you can wait enough, anger itself becomes compassion. It is a wheel; it is moving on its own --YOU are in a hurry. Just as night becomes day if you can wait a little, in the same way, anger becomes compassion if you can wait a little. The same energy --just patience has to be added to it, nothing else. You try it. Remember one thing: never do anything in the mood when the poison is possessing you; just wait. When the poison has started changing into its other.... This is one of the basic laws of life: that everything continuously changes into its other. Just as I told you that man changes into woman, woman changes into man, there are periodical changes in you --the good man becomes the bad, the bad man becomes the good; the saint has sinner's moments and the sinner has saintly moments... one has just to wait. Act when the saint is uppermost --that's all. Don't act when the sinner is uppermost, don't act when anger is uppermost, otherwise you will repent and you will create a chain of reactions and you will get into karma. That's the whole meaning of getting into karma. Do anything when you are in a negative moment and you will be in a chain, and there is no end to it. When you are negative you do something, the other becomes negative, the other is ready to do something --negativity creates more negativity. Negativity provokes more negativity, anger brings more anger, hostility brings more hostility, and things go on and on and on... and people have been entangled with each other for LIVES together. And they continue! Wait. When you are angry, this is the moment to meditate. Don't waste this moment anger is creating such great energy in you --it can destroy. But energy is neutral --the same energy that can destroy, can be creative. Wait. The same energy that can shatter, can shower life --just wait. Waiting and not doing anything in a hurry, one day you will be surprised, seeing the inner change. You were full of anger, and then anger goes on and on and comes to a climax... and then the wheel turns. And you can see the wheel is turning, and the anger is relaxing, and energy is released, and now you are in a positive mood --the creative mood. Now you can do something. Now do. Always wait for the positive. And what I am saying is not repression. I am not saying to repress the negative, I am saying watch the negative. Remember the difference, tremendous difference is there. I am not saying sit on top of the negative, forget the negative, do something against it --no. I am not saying that. I am not saying when you are angry, smile --no; that smile is false, ugly, phoney. Don't smile when you are angry. Then close the room, keep a mirror in front of you, see your angry face yourself. There is no need to show it to anybody else. It is your business, it is your energy, it is your life, and you have to wait for the right moment. Go on looking in the mirror: see the red face, the red eyes, the murderer there. Have you ever thought that everybody carries a murderer inside? You also carry a murderer inside. Don't think that the murderer exists somewhere else -somebody else is a murderer who commits a murder --no: everybody has the possibility to commit a murder. You carry the suicidal instinct in you. Just look in the mirror: these are your climates --you have to be acquainted with them. This is part of the growth towards self-knowledge. You have heard so much, from Socrates to today: "Know thyself" --but this is the way to know thyself. "Know thyself" does not mean sit silently and repeat, "I am Brahma, I am Soul., I am God, I am This" --all nonsense. "Know thyself" means know all thy climates, all possibilities --the murderer, the sinner, the criminal, the saint, the holy man inside you, the virtue, the God, the Devil --know all the climates, the whole range of it, and by knowing it you will be discovering secrets, keys. You will see that anger cannot be there forever --or can it be? You have not tried it; you try it --it cannot be there forever. If you don't do anything, what is going to happen? Can anger hang there forever and forever? Nothing hangs there forever. Happiness comes and goes, unhappiness comes and goes. Can't you see a simple law? --that everything changes, nothing remains permanent. So why be in a hurry? Anger has come --it will be going. You just wait, have a little patience. Just look in the mirror and wait. Let anger be there, let your face go ugly and murderous --but wait, watch. Don't repress and don't act according to the anger, and soon you will see that the face is becoming softer, eyes are becoming calmer, the energy is changing --the male turning into female... and soon you will be full of radiance. The same redness that was anger, now is a certain radiance --a beauty on your face, in your eyes. Now go out: the time has come to act. Act when you are positive. Don't force positivity, wait for the positivity to come on its own. This is the secret --when I say "learn to transform your poisons into honey" this is what I mean. And third: share. Whenever it is negative, keep it to yourself. Whenever it is positive, share. Ordinarily, people share their negativities; they don't share their positivities. Humanity is simply stupid. When they are happy they don't share, they are very miserly. When they are unhappy they are very very spendthrift --then they are very much ready to share. When people smile they smile very economically --just so, so far. But when they are angry they are totally angry. The third step is to share the positivity. That will bring your love flowing riverlike, arising from your heart. Your dilemma of the heart will start moving when you share. The real thing is not what you are giving --pearls and holiness and love - and TO WHOM you are giving; that is not the point. The point is that you are giving. When you have, give it. Gurdjieff used to say, "All that I hoarded was lost, and all that I gave is mine. All that I gave is still with me, and all that I hoarded is lost, gone." True: you have only that which you have shared. You have only as much love as you have shared. Love is not a property to be hoarded, it is a radiance, a fragrance to be shared. The more you share, the more you have; the less you share, the less you have. The more you share, the more will be arising from your innermost core --it is infinite: more will be welling up. Draw water from a well, and more water comes running fresh into the well. Don't draw the water, close the well, become a miser, and no more springs will function. By and by, spring will become dead, blocked; and the water that is in the well will die, will become stale, dirty. The flowing water is fresh... the flowing love is fresh. So the third step towards love is: share your positivities, share your life, share all that you have. Whatsoever beautiful is with you, never hoard it. Your wisdom, share; your prayer, share; your love, your happiness, your delight, share. Yes, if you cannot find anybody, share it with dogs --but share. Share it with rocks --but share. When you have pearls, throw them --don't bother whether they are swine or saints, just throw them. The thing that Mattereth is giving. Hoarding poisons the heart. All hoarding is poisonous. If you share, your system will be free of poisons. And when you give, don't bother whether it is responded to or not. Don't even wait for a thank-you. Feel grateful to the person who allowed you to share something with him. Not otherwise --don't wait, saying deep in your heart that he should be thankful because you shared something with him. No --feel thankful yourself that he was ready to listen to you, to share some energy with you... that he was ready to listen to your song... that he was ready to see your dance... that when you had come to give to him he didn't reject --he could have rejected. Sharing is one of the most spiritual virtues, one of the greatest spiritual virtues. And the fourth: be nothing. Once you start thinking that you are somebody, you stop; then love does not flow. Love flows only out of somebody who is a nobody. Love abides only in nothingness. When you are empty, there is love. When you are full of the ego, love disappears. Love and ego cannot exist together. Love can exist with God but cannot exist with the ego, because love and God are synonymous. Love and ego are impossible to be together. So be nothing. That is the meaning of being humble, meek. Says Jesus: Blessed are the meek, for theirs is the Kingdom of God.